Dr. Paul Valenza, a native Texan, attended the University of Texas at Austin for his undergraduate studies, and received his D.P.M. degree from the California College of Podiatric Medicine in San Francisco. He went on to complete the highly prestigious Harris County Surgical Residency Program in Houston, Texas. He is a member of the American Podiatric Medical Association, the American Academy of Podiatric Sports Medicine, and the Texas Podiatric Medical Association. Teaching appointments have included clinical biomechanics for the Harris County Surgical Residency Program. 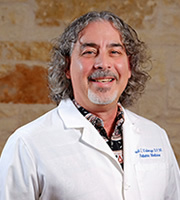 Dr. Valenza is an active staff member at Peterson Regional Medical Center in Kerrville Texas. His practice is very well rounded, with a strong emphasis in podiatric biomechanics, sports medicine, and diabetic foot problems. In his free time, he enjoys spending time with his family, playing classical guitar, ranching, and hiking. The Texas Hill Country has been his home since 1998, and he has established a formidable reputation within the community.